I noticed three errors in the review of "Whom Gods Destroy" (TOS, Series 3). 1/ The YATI entry states that Garth's explosive doesn't do much to Marta. In fact, it seems to vapourise her. 2/ In light of the above the "Body Count" should be one, not zero. 3/ The "Plotline" section states that the episode takes place on "Tantalus V". That was the location for "Dagger of the Mind"; the venue for "Whom Gods Destroy" is "Elba 2". 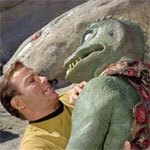 Cyrus Ramsay wrote: I noticed three errors in the review of "Whom Gods Destroy" (TOS, Series 3). 1) It doesn't say it doesn't do much to Marta, just that it doesn't do much. If the flask was supposed to destroy a planet, then one drop should have been like a nuclear bomb. It was more like a hand grenade. According to YATI, "The Fabrini language is rather peculiar - it consists of only two symbols, a triangle and an upside down triangle!". 1/ It seems to take Kirk a long time to tell Natira about the danger that Yonada poses. We're about 35 minutes into the episode before he does so and he's on his second visit to the asteroid at the time. 2/ Kirk arranges to change Yoanada's course but doesn't warn Scotty to move the Enterprise out of the way before doing so. ST:TNG Season 7 - "Parallels"
The "Body Count" section needs updating. In at least one reality, Geordie LaForge dies after a Cardassian ship attacks the "Enterprise". "Captain, what scale would you recommend for a model train set.?" Not a major thing, just a couple thoughts which I think should be considered for addition into the YATI sections of these episodes. In the episode "Pen Pals", Data has extended the range and usability to the sensors. Even going so far as to have pieces of the sensor system lying about on the Bridge (which Data later states he will remove to his quarters). Who authorized this? Are we to assume that anybody can experiment with the sensors if they want, without authorization? AND they can take it back to their quarters?! More than likely you need authorization to do anything to a ship that might affect it's capabilities even if they are for the better. Chances are since this isn't something Data just thought up, it probably did affect the ship's capabilites elsewhere.